LAHORE,Sep 21 (APP)- Pakistan test cricket captain, Misbah ul Haq said on Wednesday that maintaining number one status in test cricket will be a challenge for his side and greater efforts are needed to show consistency to remain number one test team in the world. 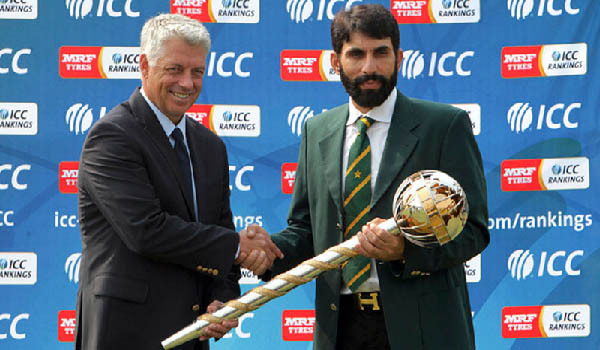 “ Now the real test of the team starts as it will be difficult to maintain the same status but more hard work and commitment on part of team members can help to remain at the top”, he said while addressing a news conference here at Gadaffi stadium in the presence of Chief Executive, David Richardson after receiving the ICC test championship Mace for becoming test number one team in the world. Misbah termed it the happiest day of his life as the team got into world number ranking,saying these are unforgettable memories of his cricket career. He said it was his wish that under his captaincy the team gains the highest world ranking in test cricket and he was content that it finally happened after a good tour of England. “We played quality cricket in that series though it ended in a 2-2 draw ,but the team put up its best to live upto the expectations”,he said.Misbah congratulated the entire nation for achieving this honour and attributed it to collective team efforts. He said it is his wish that international cricket returns to Pakistan which is playing at off shore venue of UAE for a long time. “The conditions in UAE are familiar to Pakistan but not exactly like Pakistan,and I want to see my team playing in Pakistan.However,he said the return of international to home turf depends on security and allied issues. Misbah said Pakistan team face a big challenge in its coming assignment when it plays the West Indies. “West Indies is a unpredictable side like us and they are tough opponent to beat and I foresee a close competition between the two teams at UAE”, he said. Pak test cricket captain said after playing West Indies the tour of New Zealand and Australia are of greater importance and equally tough assignments for Pak team. “They are two world best sides and Asian teams struggle against them in most of the cricket events taking place in New Zealand and Australia”,he maintained. He said every team faces hard times and what is important is to foresee good times in difficult situations to perform better and to add to the confidence of the players. “A victory is always important and encouraging, but there is always room to improve after every match or series and that is big way to learn and to play positive cricket”,he added. Misbah said it is his wish to play India in a test series before retiring from cricket.”Playing India is something special,not only for Pakistani team,as it is a similar feeling which also exists in the Indian team and their players”. Misbah said Pak One day team needs hard work to improve its performance as this version of the game has changed and One day cricket has become high. “We have to pay attention to our club,school and first class cricket to evolve a programme to adapt the young players to develop the culture of playing high quality cricket”,he said,adding,”Changes cannot be brought overnight and sustained efforts are needed to achieve that task”.